Honoring the past . . . funding the future . . .
For Anne Thunder, St. Madeleine Sophie’s Center is a home away from home. Having attended nearly all of her adult life and part of her childhood, the Center has been a kindred place for Anne and her mother, Mrs. Genevieve Thunder, who helped launch St. Madeleine Sophie’s Center. The 11th of 14 children of Joseph and Genevieve Thunder, Anne was born with Down syndrome. Anne’s older sisters had attended the Convent of the Sacred Heart where Mrs. Thunder met Rev. Mother Mary Mardel. Because of this connection, Mrs. Thunder and other mothers of children with special needs joined Rev. 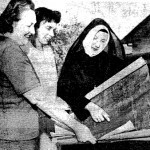 Mother Mary Mardel in creating a new school to prepare special needs children called St. Madeleine Sophie’s Center School for Exceptional Children. The new school was opened by the Religious of the Sacred Heart in January 1966, where Anne was one of the first few students. In 1975, a new federal law (the Lanterman Act) mandated that the public school system assume responsibility for training these young students. Anne was soon enrolled in Madison Elementary. After graduating from El Cajon Valley High School where she was crowned Prom Queen, Anne came back to the school now called – St. Madeleine Sophie’s Center – a Day Training Center for adults with developmental disabilities. Today, Anne comes to the Center five days a week where she enjoys Sophie’s Gallery Art Program, gardening, and swimming. Fast forward to 2013 — nearly 50 years after St. Madeleine’s opened. Today, St. Madeleine Sophie’s Center is a day program for over 400 adult students. 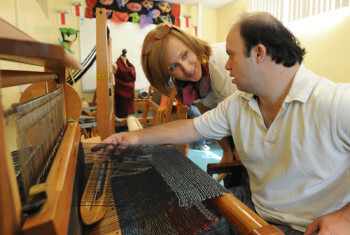 Now more than ever, families and care providers of adults with developmental disabilities are seeking a safe place where their loved ones can spend their days continuing to learn and express themselves through art, music, dance, culinary arts, gardening, aquatics and fitness, job training and supported employment and much more. Stephanie Monis, age 22, has been at SMSC for two years. At 3 years old, Stephanie showed early signs of delayed development. The Children’s Developmental Evaluation Center diagnosed Stephanie with Autism. Due to her parents’ continuous concern and involvement in Stephanie’s well-being, she was enrolled in a speech intensive therapy program to increase her verbal skills. Additionally, Steve and Cheri (Stephanie’s parents) enrolled Stephanie in the best programs throughout San Diego County. After repeated, brief (albeit serendipitous) encounters with St. Madeleine Sophie’s Center, Cheri finally toured the campus as Stephanie approached enrollment age. After the tour, Cheri knew St. Madeleine Sophie’s Center was the place for Stephanie because it was the “perfect match” for what Stephanie needed, which was a safe environment that would allow her to experience and express herself beyond academic achievement. Developmental Disabilities are not going away. We are asking YOU to honor the past and invest in the future TODAY with a gift of at least $100. However, no gift is too small. Every gift counts . . . every gift matters . . . in the lives of adults with developmental disabilities. 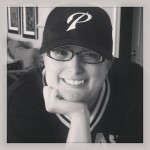 Send your gift TODAY in the enclosed envelope or donate online by visiting www.stmsc.org. 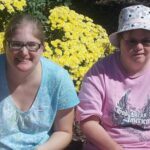 Thank you in advance for supporting Anne, Stephanie and the 400+ students with developmental disabilities who attend St. Madeleine Sophie’s Center . . . and for the many students in years to come! P.S. Today, our per-student funding gap is $2,000. Donations to our annual appeals are an important source of gap funding. Will you please consider a gift of $100 or more? Donations received by December 31, 2013 qualify for a tax deduction and will be listed in our 2013 list of supporters. Our Tax ID number is: 95-1957332. P.P.S. Looking for a different gift option? Consider a planned gift such as a bequest or estate gift. Contact us today if you are considering a planned gift. Let us recognize your caring generosity as a member of our Legacy Circle. Contact Kellye Buchanan, Development Coordinator, TODAY at (619) 442-5129 ext. 332 for more information, or if you’ve already left SMSC in your will or estate.